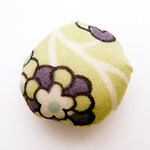 Remember I made this colourful, flowery pincushion for a swap? Well, I thought some of you might fancy a flower wreath pincushion too ... so, here's a tutorial with lots of pretty pictures showing you how to make one for yourself. Have fun! 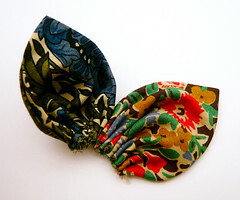 To get started you'll need; fabric (I used heavy linen for the wreath and Liberty prints for the flowers. 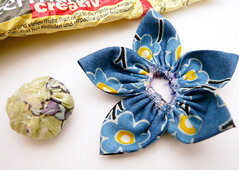 You only need a tiny amount of fabric for the flowers - so save those scraps! 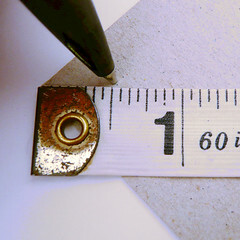 ), cardboard, a ruler, a pen, a sewing machine (although, you could sew everything by hand if you fancied), scissors, thread, stuffing (I used wool roving, but any stuffing material would be fine) and fabric glue (not essential, you could hand sew instead). And, don't forget: ironing makes your sewing look even better! 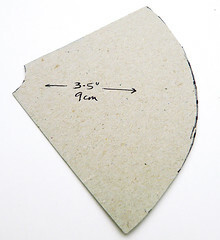 We'll start by making a template for the wreath base. 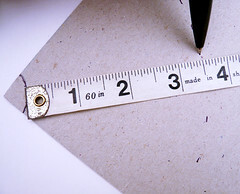 Measure and mark another curve, this time beginning at the first curve you drew and extending 3 1/2" (9cm). Cut along the two curves. 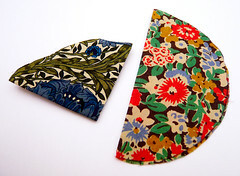 Fold and iron the fabric for your wreath base into quarters (in half, and in half again). 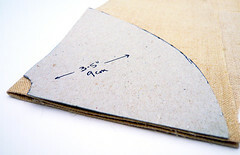 Lay the template along the folded corner of your fabric and cut. 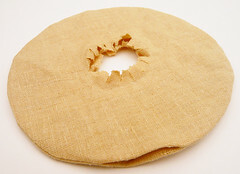 Your cut piece should open out to be a circle with a circular hole in the middle. 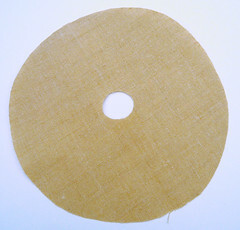 Iron flat and repeat, so that you have two circular pieces. 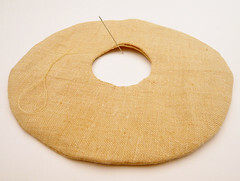 With right sides together, sew the two circles together around the outside (with a seam allowance of about 1/2" (1.5cm), leaving a gap of about two inches (5 cm). 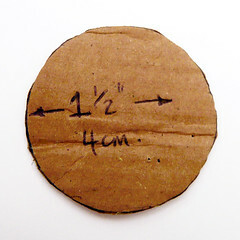 Mark a circle 1/2" (1.5cm) in from the centre hole. 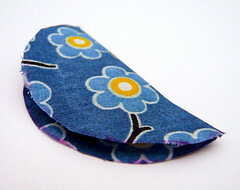 Next, snip almost to the seam around the entire circumference and, almost to the circle around the centre hole. Turn the wreath right side out (this may take some thinking - it did me! 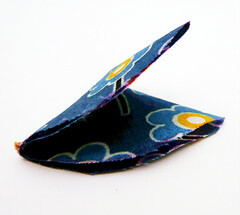 ), carefully fold the central clipped edge inwards and iron. 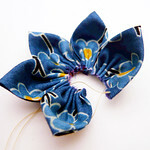 With as small stitches as you can manage, hand sew the centre closed. 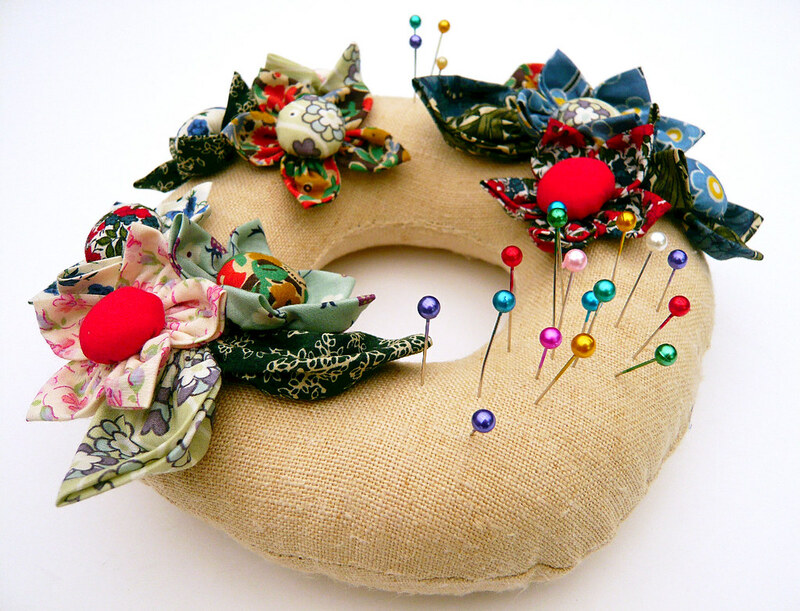 Stuff the wreath through the opening on the outside edge. Just make sure that you stuff it nice and tight! 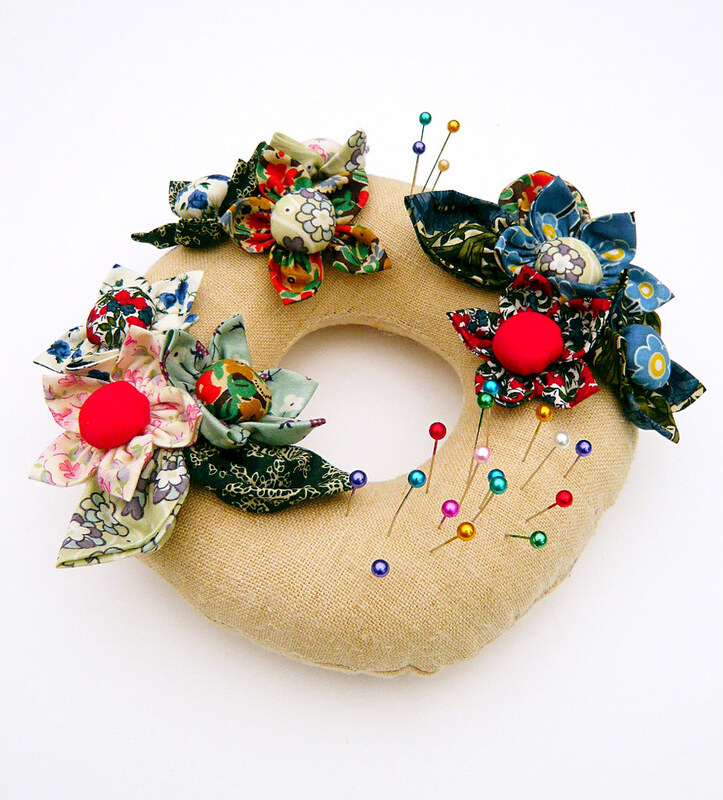 Hand sew the outside opening closed and do your best to shape the wreath into a doughnut. 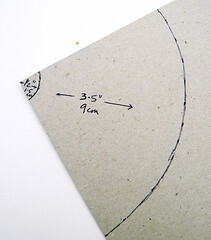 Cut a cardboard circle with a 2" (5cm) diameter. 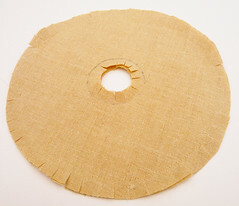 This will be the template for your flower petals. 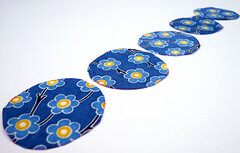 Cut five fabric circles for each flower. Iron the circles and then iron in half, and half again. 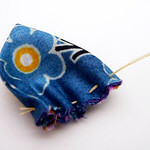 Knot the end of your thread and sew a running stitch along the long, raw edge on your petal. 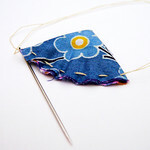 Pull the thread tight and continue along the next petal. 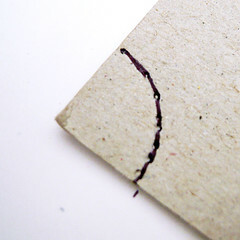 Don't cut your thread! 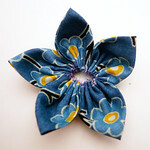 Keep going until you've stitched all five petals. 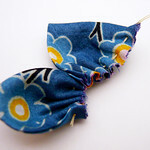 Pull the flower tight and secure the last petal to the first petal, knot and cut your thread. Isn't it pretty? 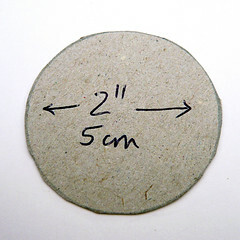 Cut a cardboard circle with a 1 1/2" (4cm) diameter. 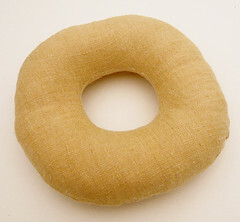 This will be the template for your centre "puffs". 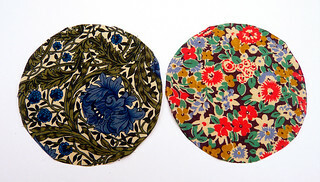 Cut a fabric circle for each flower. 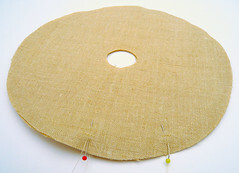 Knot your thread and sew a running stitch around the circumference of the fabric circle. 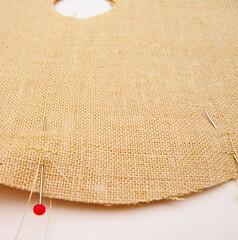 Pull slightly with the right side of the fabric facing out. 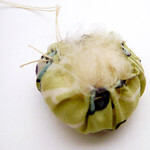 Pop a small ball of stuffing into the middle. 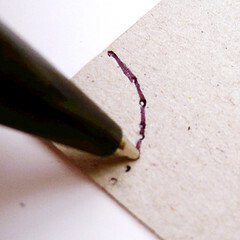 It helps to press it down with a pen while you pull the stitching tight. Stitch the edges closed and secure. 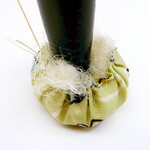 Turn it over - there's your puff! I decided to glue the puffs to the middle of the flower with super-strong fabric glue, because I wanted them evenly squashed in the middle. 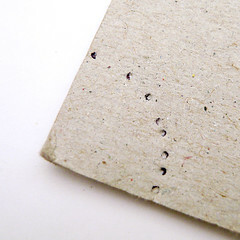 You could hand stitch it on if you don't have glue, or don't want to use it. Repeat for all your flowers. 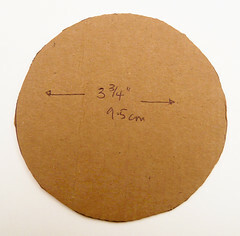 Cut a cardboard circle with a 3 3/4" (9.5cm) diameter. This will be the template for your leaves. 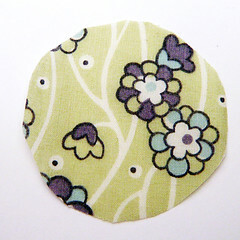 Cut a fabric circle for each leaf. I made two sets of two leaves. As before, iron flat, iron in half and then in half again. 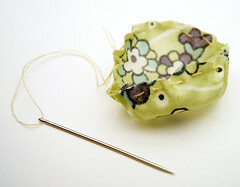 And, as before, knot your thread and sew a running stitch along the long, raw edge of the leaf. Pull tight and carry on to the second leaf. 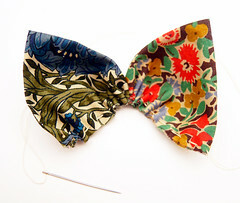 This time, pull the thread tight and secure at the end of the second leaf. As always, I'd love to see photos of anything you make using a Truly Myrtle pattern or tutorial - feel free to show off your lovely things in the Truly Myrtle Flickr group! 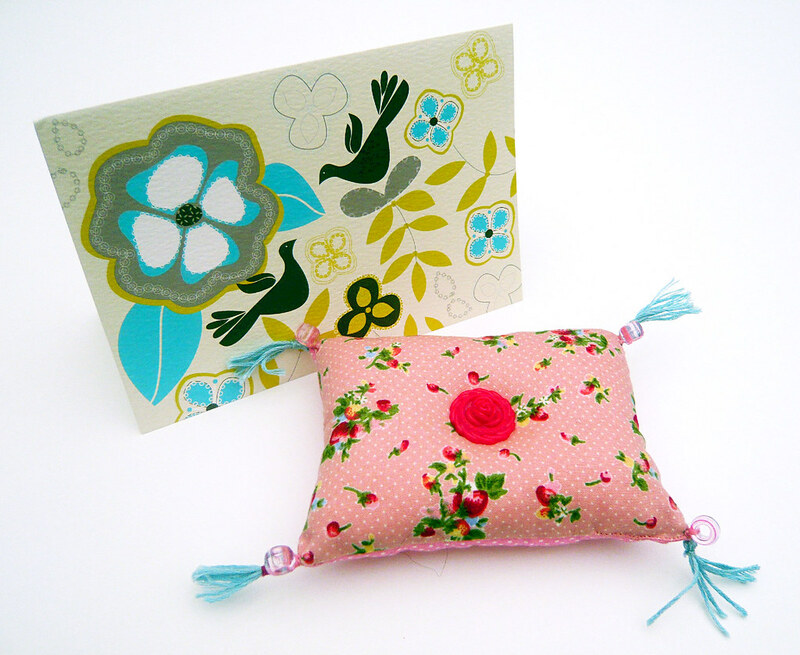 I've just taken part in my first swap - a pincushion swap, organised by Rachel at House of Pinheiro. 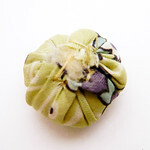 The idea was to create a pincushion from bits and bobs in your stash and send it to your allocated swap partner. My partner was Kate from the lovely blog Trestle and Bunting. Kate is crafty, green fingered, a foodie and makes the most fantastic sock creatures, she is clearly a talented lady - take a peek. 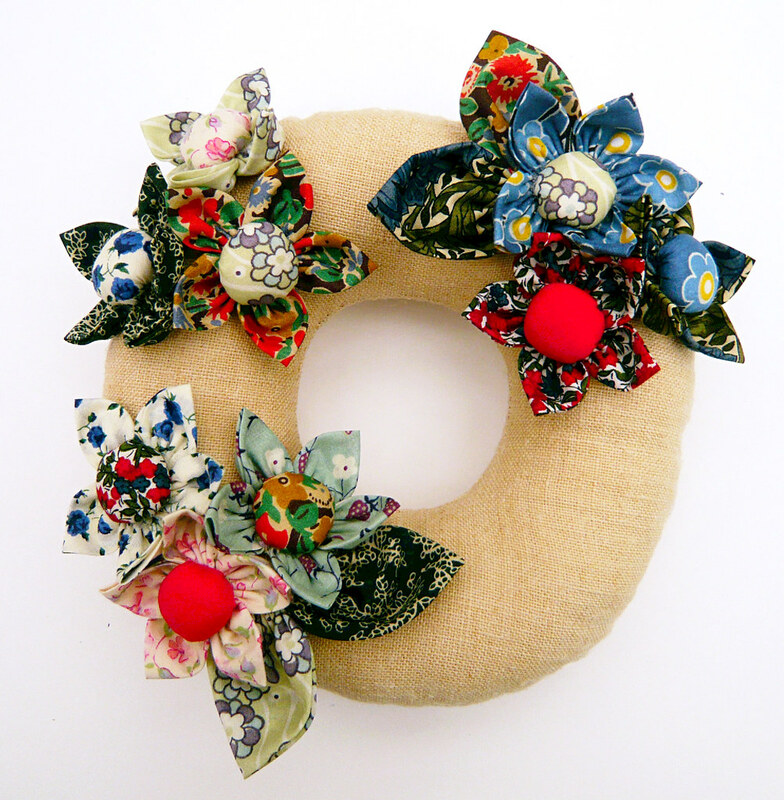 I came up with this crazy colourful wreath idea and crossed my fingers that it would be up Kate's street. I think it was - she said it was very tactile and she loved the flowers. Phew! If you'd like to have a go at one for yourself, I'm making a tutorial to show you how, step by step. The flowers are especially fun. Pop back! It'll be ready later this week.